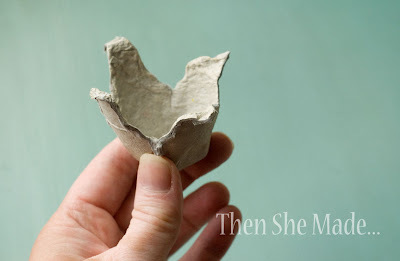 I had a bunch of egg cartons left over from Easter and instead of throwing them out, I hung on to them. They sat on top of my fridge for awhile. They filled that space quite nicely but they were truly destined to be something else. They needed to be flowers and so that's exactly what they became. And, I love them. 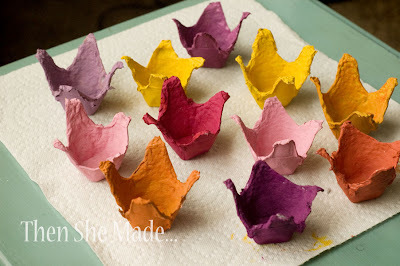 And, before I go any further with the tutorial, these would be awesome to make for a mom or a grandma for Mother's day. An adult might have to help with the cutting but kids could pretty much do everything else and I think - actually, I know - they'd have fun doing it too. 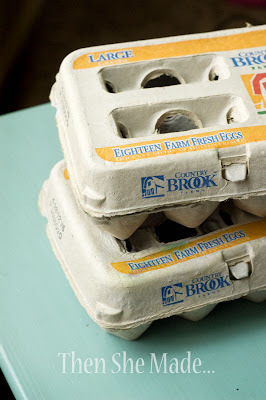 First, you will need a pulp paper egg carton. Using scissors, cut the carton apart. 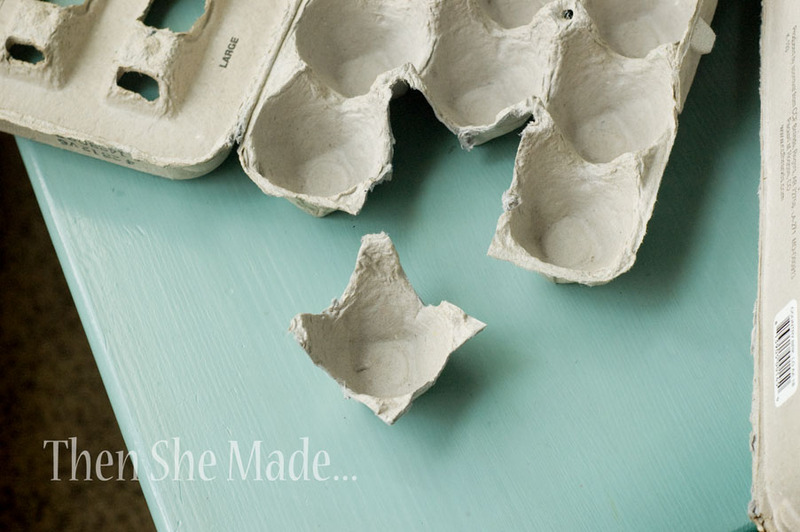 You only need the little egg holder parts, does that even make sense? If not, look at the picture, that might make it more clear. You can cut out as many as you want. I did about 10 or so. I wanted enough to make a bouquet. After you get them all cut out, use craft paint and give them a nice coat of color. 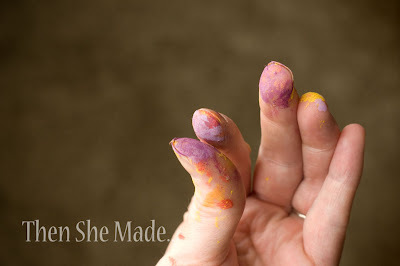 Warning: Your hands will also get a nice coat of color too! Let them all dry. 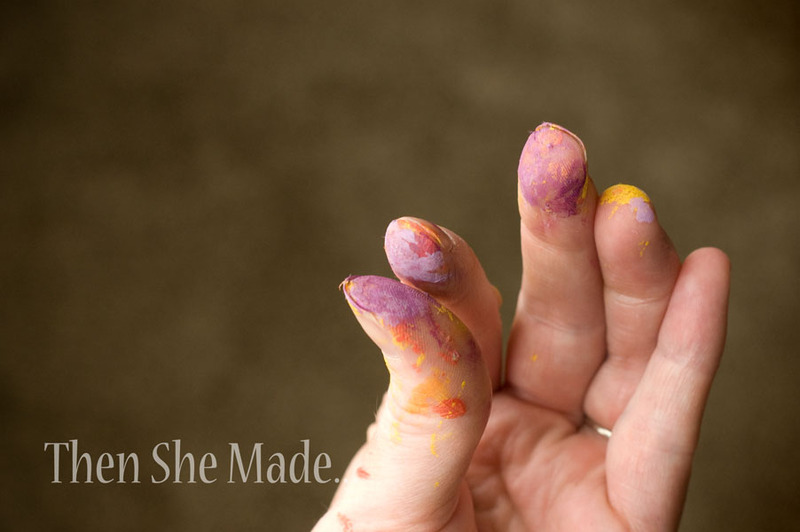 It will take a little longer than normal for the paint to dry. 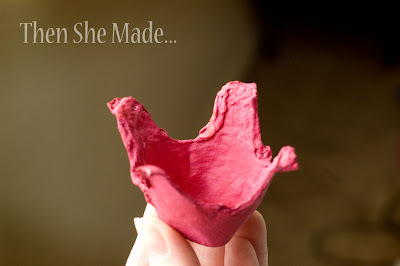 When they are dry, poke a hole in the bottom of each one. Next, take some baby breath - it's not the real stuff, I just got mine at the $1 store - and cut some small portions out of the bunch. 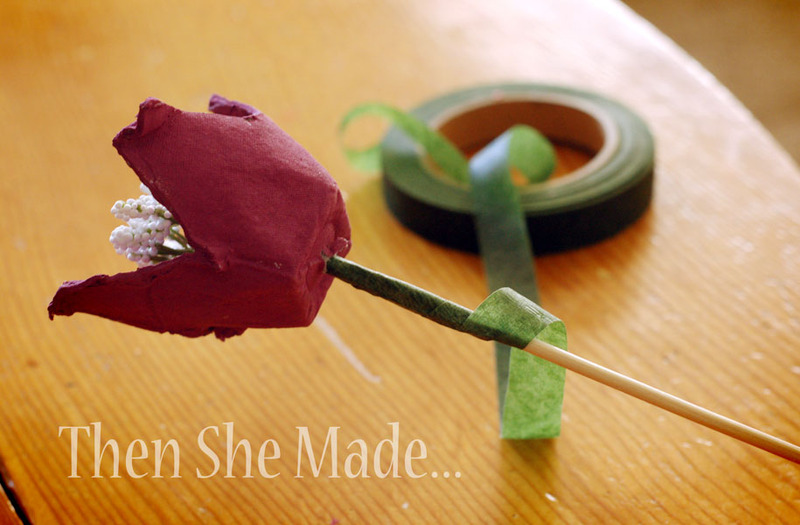 Just make sure that you leave the stems kind of long. 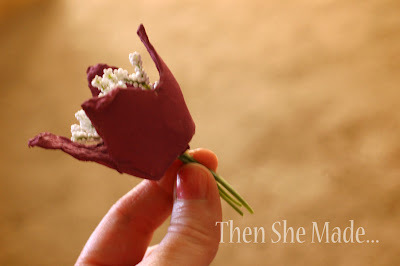 Then, take the baby breath and push the stems into the hole on the flower like shown. 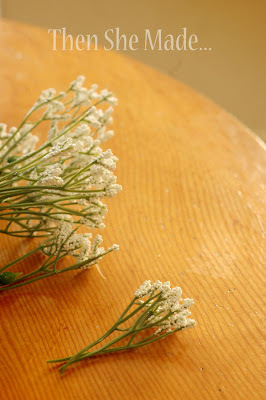 Next, take a food skewer stick and place it at the base of the flower next to the stems from the baby's breath. Then, using floral tape, wrap the skewer and stems together with the tape. Continue wrapping the tape all the way down the stick. You're almost done! 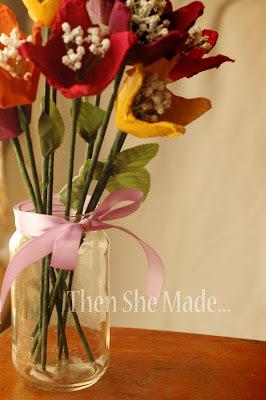 Next, find a vase or a jar, tie on a cute little bow and put your flowers in it. That's it - you're done! Easy peazy lemon squezy! Don't you think they are "egg"celent flowers?! Love this. It actually reminds me of art class in elementary school...I'm not sure we did anything eggsactly like this (lol), but I remember using lots of egg cartons in art class! 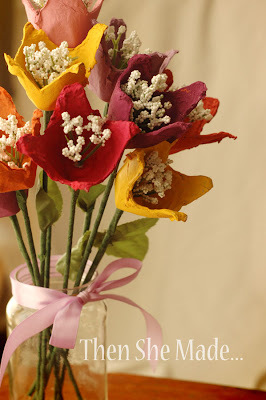 I never thought of using silk flowers for the center of this type of craft. (Which is really funny as I owned a florist shop for years.) 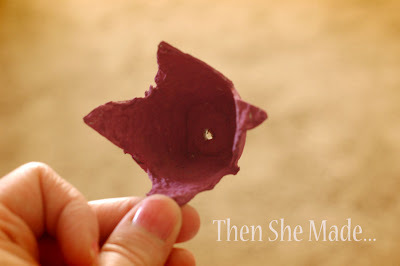 When my boys were little I remember one of them making egg carton flowers with a center that was filled with confetti. Yours are really pretty and would look nice on display for a long time. These are darling! Good job! Adorei a idéia parece papel mache. Awesome idea! Just make sure you use led lights as the normal one will get hot and be a fire hazard.